Organization is the key to running a smooth front-end office operation. Information and details regarding appointments and customers should be readily available in order to quickly service customers. 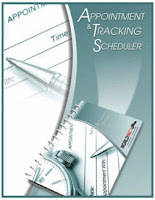 Manage appointments and scheduling tasks conveniently and efficiently on a yearly appointment & tracking scheduler designed specifically for the independent service center. Only $49.95 each. Order today!